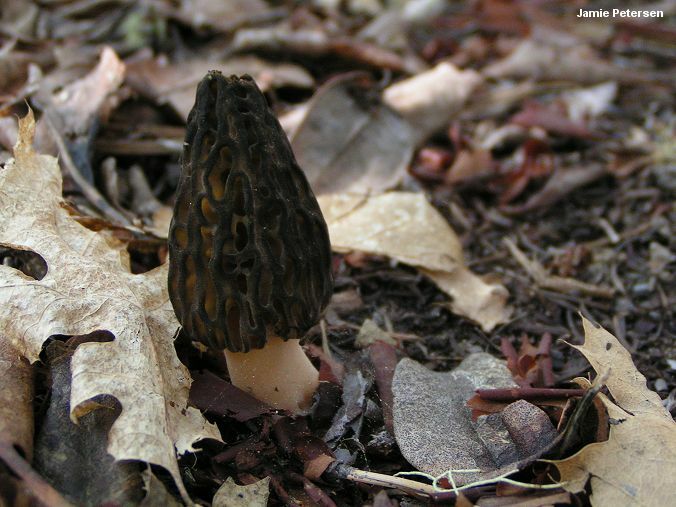 This species of morel is the western North American version of Morchella angusticeps--and if you were handed collections of each of these species, with no information about where they came from, you would have no luck separating them without recourse to expensive and time consuming DNA testing. Fortunately, my little scenario isn't likely to unfold for anyone, since the Rocky Mountains separate the ranges of the two species. 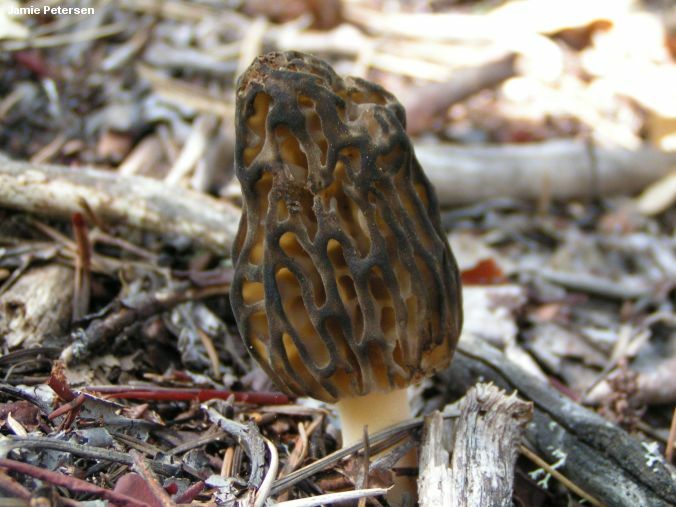 Among the western black morels, Morchella brunnea is fairly easily separated since it appears in non-burned forests, and because it features ridges that are dark throughout development and a stem that is not prominently ridged and pocketed under normal growing conditions. 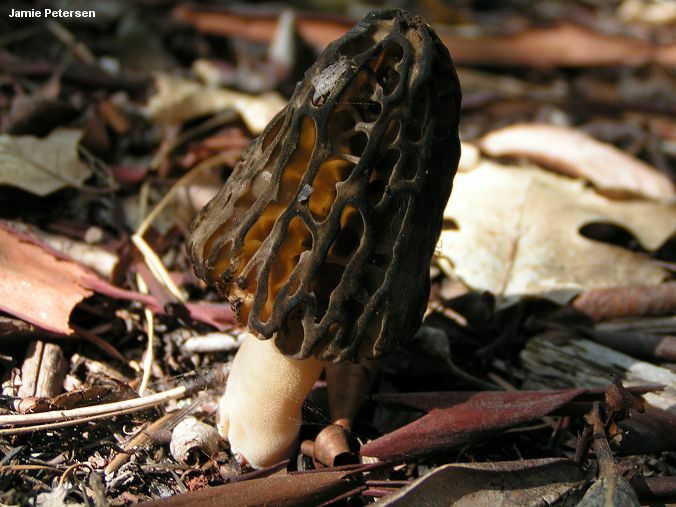 However, a poorly known species (Morchella species Mel-8) is very similar to Morchella brunnea, and further collections and study will be required before we know if there is a sure-fire way of separating the two species without DNA analysis. Ecology: Possibly saprobic and mycorrhizal at different points in its life cycle; appearing under hardwoods, including oaks and Pacific madrone--and possibly under conifers; spring; documented from Oregon but probably to be expected throughout western North America. Cap: 3-5 cm tall and 2.5-3.5 cm wide; conical or nearly so; pitted and ridged, with the pits primarily arranged vertically; when young with bald or finely velvety, flattened, dark brown to black ridges and pale tan pits; when mature with flattened to sharpened or eroded, black ridges and brown to yellowish brown pits; attached to the stem with a small groove (2-3 mm deep); hollow. Stem: 2-5 cm high and 1-3 cm wide; equal, or with a slightly swollen base; whitish; bald or finely mealy with granules; developing fine ridges and/or a few folds near the base; hollow. Microscopic Features: Spores 22-36(-40) x 14-20(-25) µ; smooth; elliptical; without oil droplets; contents homogeneous. Asci 8-spored. Paraphyses cylindric with variable apices; septate; hyaline in KOH. Elements on sterile ridges 75-160 x 12-28 µ; septate; hyaline to brownish in KOH; terminal cell clavate (sometimes strikingly so), subcapitate, or widely subfusiform. SPECIMENS EXAMINED: Herb. F. 04100401. Herb OSC 138686 (holotype). Kuo, M. (2012, October). Morchella brunnea. Retrieved from the MushroomExpert.Com Web site: http://www.mushroomexpert.com/morchella_brunnea.html.